When a Roman Catholic nun dropped a dime on the late Francesco “Skyball” Scibelli for running an illegal gambling ring from the telephone booths at Providence Hospital in 1961, divine intervention and the related jail time weren’t enough to dissuade him from running the rackets. 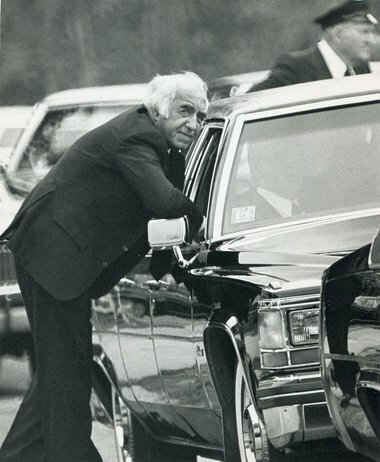 Frank "Skyball" Scibelli at Sam Cafari's funeral, outside the Forestiere Funeral Home in September 1983. His underlings over the years included the Scibellis, Adolfo (who would ultimately earn the nickname “Big Al”) Bruno, Felix Tranghese and a collection of lesser-known soldiers and associates. A native of Calabria, Italy, Cufari fought being stripped of his American citizenship in the 1950s, attended the famed “Little Apalachin” summit of leading U.S. Mafia figures in New York state in 1957 and rebuffed a summons in 1972 from a U.S. Senate Committee that was probing an organized crime monopoly of cleaning products purchased by labor groups in Boston and New Jersey. Cufari and other gangsters were purportedly pushing the widespread sale of the locally manufactured “Poly-Clean” on unions to promote “labor peace,” according to witnesses. Then violence erupted with bar brawls, attempted shootings, the disappearance of a lower-level associate, Gary D. Westerman, and, ultimately, with the startling execution of Bruno. Paid gunman Frankie A. Roche admitted firing six shots into Bruno as the mobster left his regular Sunday-night card game in the South End. Bruno’s familiar cigar was still smoldering near his body in a parking lot when police arrived.